The bottom of the bayou�s the limit at Swamp Daddy�s � real, good Cajun and Creole fare. 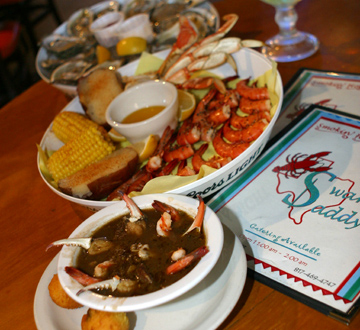 Swamp Daddy�s Seafood Grill puts a delightful twist on traditional Cajun \r\nand Creole fare. 740 Lincoln Square (on the Road to Six Flags), Arlington. 817-469-4747. 11am-2am daily. All major credit cards accepted. Having honed his chops as owner of the Lone Star Oyster Bar for 13 years, Mike Gryder recently decided he wanted a new place, one that would carry some traditional Cajun and Creole meals, but he didn�t want to resemble the other joints in Tarrant County that try to serve every famous New Orleans dish and wind up making all of them taste alike. So he grabbed a big spot in Arlington�s Lincoln Square, built a huge, oddly shaped bar in the middle of it, dressed the place up with dead animals � from a bobcat to a javelina head to a marlin to some big-mouth bass � plunked down 30-plus tables, and went to work creating some excellent but personalized renditions of classic Crescent City food. Swamp Daddy�s Seafood Grill�s take on gumbo is a good example. Traditionally, the dish is a rice-based stew loaded with seafood, chicken, and sausage and thickened with okra, a roux of flour and butter, or both. It�s the kind of meal that sticks to your belly and keeps you warm. Swamp Daddy�s Blackwater Gumbo may not fill you up as heartily, but it�s still outstanding � a decent-sized bowl filled with a half-dozen shrimp, some cracked crab legs (no claws), and a generous helping of pork sausage with rice in a rich, peppery broth seasoned with garlic, onions, celery, and sweet bell peppers. Though there didn�t seem to be any okra, the resulting tango of flavors salty and sweet more than makes up for the omission. While we�re talking history, �to grill� in Louisiana means to cook over a wood fire. Tradition be damned: At Swamp Daddy�s, they grill with gas, but only purists will be stodgy enough to complain. Swamp Daddy�s grilled tilapia is one big fish. Too many chefs dry out the meaty fish through overcooking. Here, it was moist and succulent, doused with lemon and lightly spiced with a rub of thyme and rosemary. Served on a bed of scrumptious meatless dirty rice that was well seasoned with gumbo fil� (ground sassafras and a bit of bay laurel leaf) and garlic, the fish was definitely filling. It came with sides of hush puppies, steamed zucchini and yellow squash, and a broccoli-rice casserole topped with a bit of cheddar. If you�re from the back country near N�awlins, the entr�e might not measure up to your Maw-Maw�s, but it�s still worth a visit. Equally tasty was a basket of fried alligator tail bits. Even though gator tail requires simple seasoning and deep frying, it�s a signature dish only because so few cooks know how to make it tender and moist. Swamp Daddy�s chefs have been schooled in the proper way: Get it out of the grease long before it turns chewy. After a bite of Swamp Daddy�s version, you probably won�t say, �It tastes like chicken.� It tastes exactly like what it is � mildly fishy, crisp, and juicy, with a flavor that pops in your mouth with every chew. Also good was a platter of shrimp, oysters, and catfish, all fried. You�d be hard pressed to find better catfish or oysters.The fish was still steaming inside its seasoned crust � not a trace of oily flavor, which let the richness of the fish shine. Ditto for the oysters, which came in a different breading. Their consistency and strong flavor, rather than the breading, stood out (unlike at so many other so-called seafood joints). The shrimp weren�t bad by any stretch, but compared to the catfish and oysters, they were superfluous. The platter was served with the excellent dirty rice and a piece of Cajun corn, a fresh cob that obviously had spent a few minutes in a crab-boil pot to pick up the bite that will have you reaching for the wonderful, heavy-on-the-pickles tartar sauce to cool down. Rounding out the feast was a decadent sweet potato pecan pie. No brown sugar covered with pecans here: The filling is smooth and dense, and the flavors blend with one another rather than fighting for attention. Wrapped in an excellent, light, homemade crust and topped with whipped cream, it�s worth the strain on your waistline. Swamp Daddy�s is not a slick place and is by no means fancy. It�s large, clean, and looks like fun, with several televisions mounted over the bar and a small but choice selection of video games along one wall. But don�t be distracted: Swamp Daddy�s kitchen is the real treat.